Pontiac Vibe cabin air filter location. From year 2003, 2004, 2005, 2006, 2007, 2008. 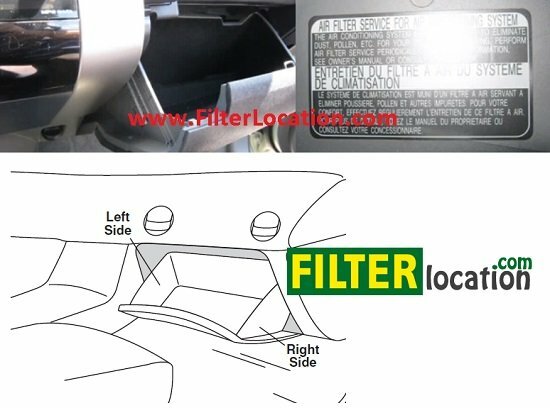 Here you can find how to locate Pontiac Vibe pollen filter when you need to replace. Where is located cabin air filter on a Pontiac. Maintenance of a car differ from a vehicle to another. If you car service is approaches, below you can see how to change air conditioning filter. Cabin air filter is located inside of car on the passenger side. Open passenger side door and then open glove compartment. Push in on left and right sides of glove compartment to release glove compartment. Pull out glove compartment – Right side of glove compartment can remains attached). Unfasten tabs on top of filter housing cover and flip down- Filter housing cover remains attached.